Watching videos on your Kindle Fire HD gives you the convenience of portability. From lying in bed or on the beach to watching your videos while waiting in line at the bank, portability can be a very convenient feature. When you tap Videos on the Kindle Fire HD Home screen, you’re instantly taken to the Amazon Video Store. 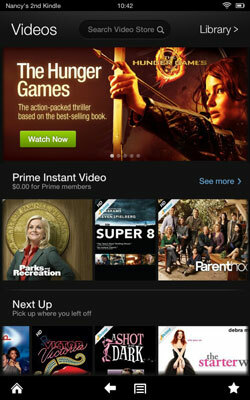 Across the top of the screen, you see thumbnails of items in the Prime Instant Videos category. Below these thumbnails is a horizontally scrolling list of thumbnails labeled Next Up that includes movies purchased. You can pick up where you left off viewing these items by tapping any of them. Tap an item in the Prime Instant Video category, and a descriptive screen appears. For TV shows, this screen includes episode prices and a set of Season tabs. For movies, this screen may include Watch Trailer, Buy, and Rent buttons. You can also scroll down and view details about the movie’s director, release year, and more. Tap a Price button, and the button becomes a Rent or Buy button. Tap this button, and your purchase or rental is processed. 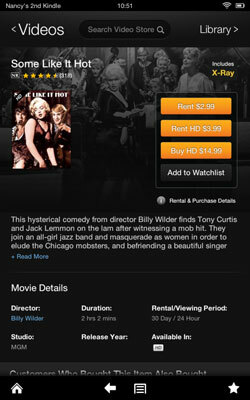 Tap a Rent $ button for movies, and you see a green button labeled Rent. Tap this, and you’re immediately charged for the rental. The rental period begins when you start to watch the movie. If you tap the Watchlist button, the item is added to your watchlist so you can go back and rent or buy it at some future time. To view your Watchlist, tap the Menu button on the Options bar when in the Videos library or store and then tap Your Watchlist. Tap any item to open a screen similar to the one shown.